Blood of my Blood is book one in a novella trilogy titled Awakening of the Spirit. 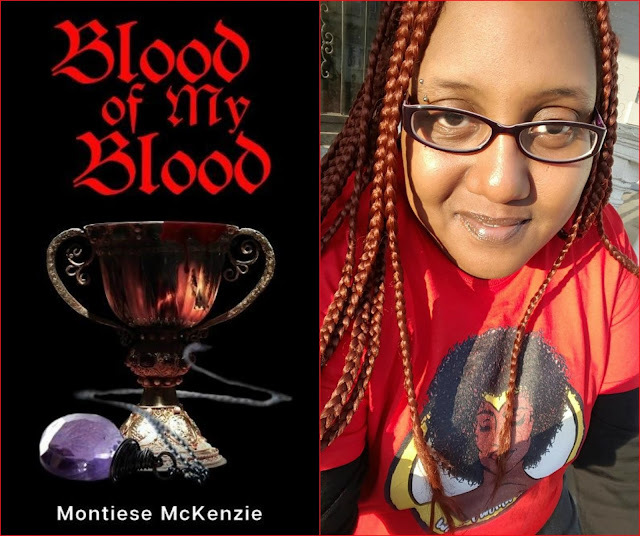 Author Montiese McKenzie introduces us to a supernatural world with familiar mythology but a healthy serving of original twists to both vampire and spirit lore. She begins the series with Washington D.C.-based FBI Agent Alexander Rubidoux, a married-to-his-job, kind hearted man who is asked to help find a high profile government employee by the wife of the missing, Kathryn Spencer. Kathryn, a Black woman whose looks defy a life lived for centuries, particularly as a native of the country we know as Russia, now dwells in a lavish D.C. estate along with her three children. But the circumstances of his disappearance unearths a supernatural world that intermingles with the mostly unknowing natural. Kathryn's vampirism stuns Alexander, but instead of running, he becomes dedicated to helping this nervous yet stoic woman and her children get the husband and father they desperately want back. Along with fangs, action, crime, conspiracy and myriad of additionally diverse non-humans that arrive for support or a fight, Blood of my Blood gets a feather with a romance element that blends seamlessly into the chaos. Kathryn and Alexander form a bond before its an obvious revelation, further confirming how instinctive their destinies are intertwined. Kathryn and Alexander's relationship is the nucleus of this story. It's an electrifying unveiling of how their interaction evolves into this pleasant tension, where the motivations of the characters, especially Alexander's becomes more clear as time passes. These two could not be more different, yet they almost share the same heart. This component is the perfect addition and is completely removed from feeling tawdry. I'm looking forward to seeing how their journey progresses. What was a bit new for me as a mostly memoir/heavy non-fiction reader is McKenzie's direct, conversationally thick approach to Blood of my Blood. Without the extensive backstory or world-building details, this allows readers the balance of having just enough history to chew on that informs the motivations of each character. This is brilliant here because it's preparation for the next two books to follow. There is a need to read the complete series with urgency due to the lingering inquiries by the end. Book one is what it's meant to be; the dynamic foundation of exposing a greater universe. Blood of my Blood's dialogue-driven path results in a meticulous investment in each character quirk and emotional nuance in every line spoken. Especially, Kathryn's words are to be examined with comb like precision, it's incredible to absorb. Her angst and joy make her a stand out. McKenzie wasn't playing school games when she described her as "Black, bold, and powerful." There is a great effort to keep an equitable spotlight on independent, non-white authors of genre fiction that write diverse characters into their stories. McKenzie with the Awakening of the Spirit series is a notable addition to this charge. Purchase Blood of my Blood exclusively on Amazon e-book for $4.99 now! Montiese McKenzie is a lifelong Philadelphia girl, writer, who somehow stumbled into accounting. As a kid if she wasn't writing stories exploring the human condition, she was stealing her mother's matches to light things on fire. With a B.A. in both History and Sociology from Bloomsburg University, Montiese combined her love of the human condition, time periods, and writing to survive five years in the boondocks. A cat mom, a sock collector, and lover of Merchant Ivory films with too much dialogue, Montiese is about to enter her fourth decade riding high on naps and snickerdoodle cookies.